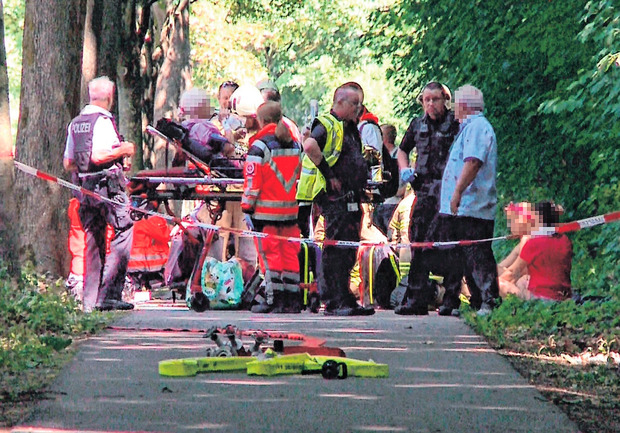 A suspect – believed to be in his mid-30s – was arrested after the stabbings in the northern city of Luebeck on the Baltic coast, north-east of Hamburg, yesterday afternoon. The motive is unclear. The bus driver immediately stopped the vehicle, allowing passengers to escape, local newspaper ‘Luebecker Nachrichten’ reported. A spokeswoman for prosecutors, Ulla Hingst, told n-tv television that the bus driver stopped the vehicle and let the passengers out after the attack. She added the weapon that the assailant apparently used was a knife, although that is still under investigation. She said the identity of the suspect, who was being questioned by police, had yet to be confirmed. “The passengers jumped out of the bus and were screaming,” said Lothar H, a witness who lives close to the scene. Police spokesman Duerk Duerbrook said the attack happened in the Kuecknitz district of Luebeck – around 65km north-east of Hamburg. The force described it as a “major police deployment”, adding that there had been no fatalities.